There is much to admire at Ron Schaefer’s gallery in Tuthilltown. Finely-painted landscapes take viewers from the Shawangunk Ridge to Yosemite National Park to Ireland; fiery paintings depict industrial scenes in Pittsburgh; classic still lifes capture nature’s bounty on pitch black backgrounds. But look closer at the frames. You wouldn’t realize it, but nearly all the frames were made by Ron, who was trained in frame-making many years ago by Robert Kulicke, a master craftsman and artist who constructed frames for the Metropolitan Museum of Art in New York. As a result, Ron can craft frames from virtually any period in art history and tell you the difference between a Flemish 17th century frame, a Florentine Italian frame, and a Federal style frame from 1830s America. There are frames he has built in the style of the Louis XIII era and the Louis XVI era. “I could teach you the difference in a second!” he says, with his customary easy smile and light chuckle. It’s just one of many interesting discoveries about a man whose artistic career has taken him in many different directions. Now 74, Ron has been drawing since the 4th grade. He was born in New York City, but came to Gardiner “on and off” as a child because he had family who owned a glass-cutting factory in New Paltz. He graduated from New Paltz High School, and after entering the engineering field, headed to Pittsburgh to work at Westinghouse. He painted during his time at Westinghouse, and was given a one-man exhibition at the highly respected Westmoreland Museum of Art. Today, his paintings of Pittsburgh’s iconic steel mills, on view at his gallery, bear witness to his love of that city and his time there. Soon he began working as a conservator, or art restorer, for galleries and museums in and around Pittsburgh. His work was noticed by Helen Frick, of the renowned industrialist Frick family, which had built art museums in Pittsburgh and New York City, and Ron assisted in maintaining her private collection. As a conservator, Ron came into contact with very old paintings that had become damaged. His task was to touch them up so they appeared new: “just like a dentist doing a filling,” he says; not imposing his own style on the painting, but staying true to the intentions of the artist. He came to Tuthilltown in 1984 and settled in the house he still occupies with his wife, Pat. 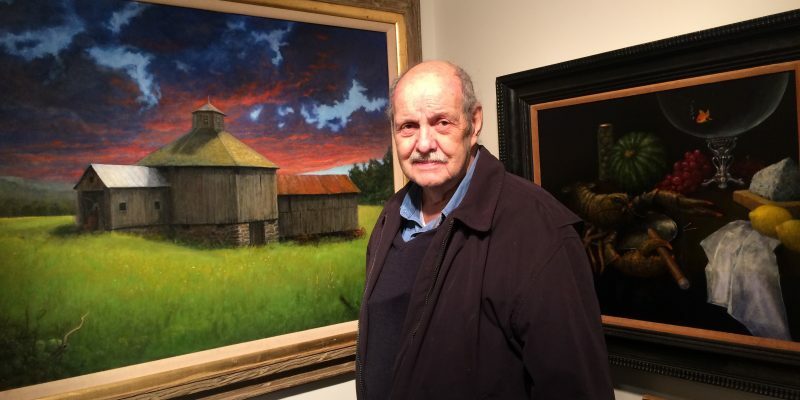 The couple raised two children, and Ron continued to paint, selling his work at various galleries in the Hudson Valley and around the Northeast. His private studio is located in an 1837 one-room schoolhouse a mile up the road. In 2014, he converted the old two-car garage on his property into his gallery. Though health issues have been dogging Ron lately, his passion for art hasn’t waned. He still tries to get out as often as possible to paint beloved landscapes. “I’ve gotten a lot slower, but I’ve gotten better,” he says. The Tuthilltown Gallery is right next to the Tuthilltown Spirits Distillery, at 8 Grist Mill Lane. Winter hours are Saturdays from 12 to 5, or call 845-943-0797 for an appointment. Become a Digital Subscriber! Complete and submit the form below to join our mailing list.